Friday evening found a couple of us setting up another Modern Spearhead game, yet again set in 1982. We use the Scenario Generation System to develop the context of our games and this uses various lists in the different scenarios that are generated. For my part I had spent a couple of hours coming up with a list that would enable me to use my West Germans. I have a tendency to use tanks that aren’t particularly powerful. However, I wanted to use something different this time to counter the T-80s my opponent has been using of late. Having not used Leopard 2s for several years I focussed my efforts on the Defend List which had some of these beasts. Of course I didn’t spend as much time on an Attack List and then found the West Germans were conducting a hasty attack. My three West German battalions, from a Panzer Grenadier Brigade, would be facing a Soviet Naval Infantry Regiment – that had no tanks! Now, I won’t give a blow by blow of the game. However, one aspect that was absolutely fascinating was the various initiatives used by the Soviets to suppress the German air defences. Critical if the Soviets were counter the Leopards. If you are interested I have placed a short article on my Modern Spearhead site. It looks at fixed wing air support and air defence suppression in general and the how it played out last night. You can find it here. With one of the local Moderns players finally free of work commitments we took the opportunity to deploy our Cold War forces for another encounter last night. Typically with games generated by the Scenario System we find attackers when selecting an attack scenario for a Hasty Attack over a Deliberate Attack. In part this is due to the additional planning required when preparing a Deliberate Attack. Last night however Andrew, commanding his Soviets, selected a Deliberate Attack. Now, I wasn’t keen to attempt another Spoiling Attack, with less than desirable results previously. In addition I believed the terrain favoured defence. Therefore, I focussed on preparing the French forces for the inevitable artillery barrage and focussed reconnaissance which was certain to occur as the Soviet attack began. The resulting game was fascinating. Concentrated the Soviets, in reinforced regimental strength, moved forward with massed artillery fires aimed at neutralising forward French positions. Then as the French were overwhelmed the the Soviet commander planned for his artillery to switch to secondary objectives. Fortunately, not everything went to plan for the Soviet commander. French forces meanwhile tried to reposition themselves in an effort to restore balance, again with mixed results. 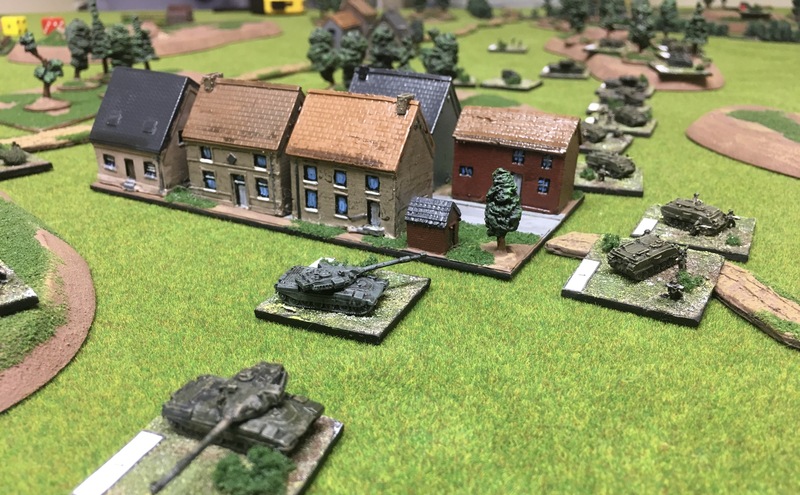 A short report of the engagement near Baudenbach, fought using Modern Spearhead and our 6mm miniatures, can be found here. 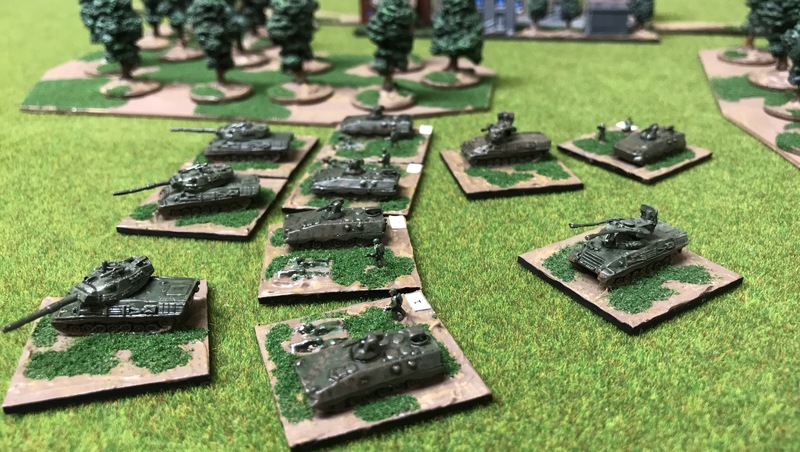 Over the last few months I’ve managed a reasonable number of WWII Spearhead games but last night we deployed our forces for a Modern Spearhead game set in Cold War Europe during 1982. The scenario developed using the Scenario Generation System found my French facing a front line reinforced Soviet Tank Regiment conducted a hasty attack. Unfortunately, with a late start and some of the nuisances of the rules needing to be confirmed, the game wasn’t fully resolved by our usual finish time. In fact as the victory conditions went it was a draw, though clearly the Soviets were clearly in the strongest position, if behind on their timings. Despite the lack of time the game highlighted many deficiencies in my force structure and the application of this force to the tactical situation. One local describes Spearhead, and Modern Spearhead as having multiple layers. If you like you have a tactical situation which is be modified by different layers of weapon systems each shaping and impacting the other. So electronic warfare, counter battery, air strikes and air defence all combine to impact the tactical situation at the sharp end. Certainly last night was a fascinating game and the following day I’m still processing what worked and what didn’t. How my opponents force composition impacted mine and how the battlefield was shaped by counter battery, electronic warfare and artillery fires. All lessons to be learnt if you like. I’ve posted a few of my post game contemplations on my Modern Spearhead blog here. Over the last week or so I thought it time I wrote a couple of short articles on some Cold War gaming topics. Specifically on forming brigade sized formations for use with Modern Spearhead and the Scenario Generation System. Most of my gaming occurs during an evening time slot and over the years we have played a large number of Spearhead and Modern Spearhead games. As such the scenario system is designed to produced reinforced brigade actions playable in an evening. However, it’s often difficult to know where to start when organising a suitable army. In a previous post I outlined a sample Soviet list so in the latest two posts I look at NATO armies. First up was the Cold War French drawing elements from a French Armoured Division. More recently I’ve considered a West German Panzer Grenadier Brigade. In each article I provide a brief outline and both a Defend List and an Attack List for use with the Scenario Generation System. A long weekend and time for a game on Saturday evening of Modern Spearhead, and what a fine game it was. The Soviets complete with BMPs and BTRs launched a considered attack on the British who conducted a flexible defence. Supported by tanks the Soviets struggled to gain traction initially, but as additional battalions were committed so the British defenders came under increasing pressure. Realising the Soviet plan the British commander ordered forward one then two battalions. Now, while Chieftains and FV432s lurched forward in counter-attacks artillery observers directed coordinated fires in support of mechanised infantry in a desperate effort to breakup the Soviet attack. Yet would the Soviet Hind helicopters wreck havoc on the British defenders around Erlabrunn? A short report of this excellent game can be found here.